Measurements: 2.8 x 5.2 inches; or 71 x 133 millimeters. Large. Back of card: Light wood colored with the vesica piscis with all manner of clever things tucked inside, including tiny scrolls with the words, "la scala d'oro". Can be inverted. Booklet included: Yes, 80 pages, 2.7 x 5 inches, or 67 x 128 mm. This is a full book. It unfortunately uses an ornate calligraphy which renders it nearly unreadable. The major arkana has a full write-up, the minor arkana is more briefly dealt with. Comments: This deck wants to look very old but isn't (US edition 1979). Disguised in the very heavy border on each card are a number of identifying marks. The artist is not as interested in showing us allegorical pictures (particularly with the minor arkana) as he is in showing us correspondences between different esoteric systems. On pgs. 14-15 in the booklet are illustrated eleven identifying marks of each major arkana card. Starting in the upper right corner & running in a counter-clockwise direction (more or less): A Hebrew numerical correspondence for the major arkana cards, for the minors, a number, (1-14 for each of the suit cards); then a Sanskrit letter corresponding to the number; an absolute number (0-77); a Hebrew letter corresponding to the Sanskrit letter; then 2 Kabalistic sigils (the author calls them Celestial Alphabet); next, the picture on the card itself; the Latin letter that corresponds to the Sanskrit & Hebrew letters; the glyph for planet or sign that corresponds to the card; the name of the card (in Italian); a Tree of Life diagram showing the connecting link; and, finally, a keyword describing the major arkana card. Suits are Swords, Cups, Staves & Coins. Court cards are King, Queen, Cavaliere (knight) & Jack (fante). There are playing card overtones in that each minor arkana card is also marked as a spade, club, heart or diamond. The pip cards are numbered three times: Once with the geometric arrangement of spots (ten coins, five swords, etc. ), second with an ornate Italian-style Arabic number, third with a more prosaic Arabic number. On each minor arkana card is a circle with the name of the "superior intelligence" (angel or daemon, in Italian), sigils, etc. These - and their Hebrew equivalents - are listed in the back of the booklet. 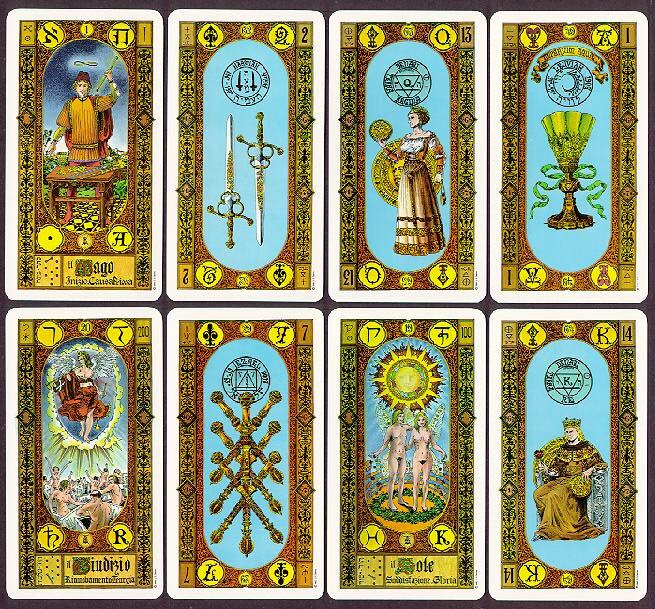 All in all, a mini-esoteric treatise in 78 cards, which in the end is what Tarot is all about. A deck of particular interest to kabalists.